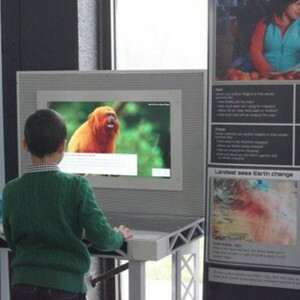 Do you want to bring Landsat to a variety of audiences? If you represent a museum, library, visitors center or other institution you may be interested in hosting the Landsat Traveling Exhibit. If you are an interpreter or interested in bringing Landsat data to outdoor spaces like parks, refuges or other public lands, then Earth to Sky may have everything you need. If Engineering is your focus, check out Engineering a Satellite. NASA, AmericaView, and USGS have created a fun and educational new poster to celebrate Earth Science Week 2018 — October 14-20, 2018. The poster offers inspiring Landsat views of the American landscape on its front and has a fun game of exploration on its reverse side. The Landsat Program is a central pillar of our national remote sensing capability and represents the world’s longest continuous remotely sensed record of the Earth’s surface. This 20”x24” poster highlights observable change in ten locations around the globe. The back of the poster describes the Landsat program and the value Landsat data to our national geoheritage. 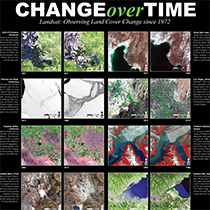 Images from the poster can be used in a matching games to discover types of land cover change. This activity was developed in collaboration with AmericaView – a nationwide, university-based, and state-implemented consortium advancing the widespread use of remote-sensing data. Earth to Sky explores how National Park Service (NPS) and U.S. Fish & Wildlife Service (USFWS) interpreters, educators, and scientists are using NASA content to help visitors connect with the natural and cultural heritage of our Nation. While Landsat observes Earth from beyond the sky, there are many things to be learned from being on the Earth. Earth to Sky bridges satellite data and ground observations to help form a better understanding of our planet. You can also learn more about the collaboration itself, and peruse the site for valuable resources. Engineering the Future By Building on the Landsat Legacy: Landsat Data Continuity Mission (LDCM). This presentation walks you through the process of building a satellite from defining the requirements to designing, building, testing, assembling, launching, and operating. Learn about the engineering challenges behind building a satellite, the new features of the Landsat Data Continuity Mission/Landsat 8, and meet some of the engineers behind LDCM! 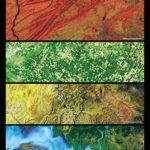 Landsat: Seeing in a Different Light is a traveling exhibit that takes visitors on a world tour viewing Earth as Landsat has it for decades. Visitors are invited to select different locations around the world to see how Landsat data is used to solve problems by measuring visible and infrared light and recording change over time. Are you a museum, library, community center or school interested in hosting this traveling exhibit? Apply now and start seeing Earth as you’ve never seen it before.